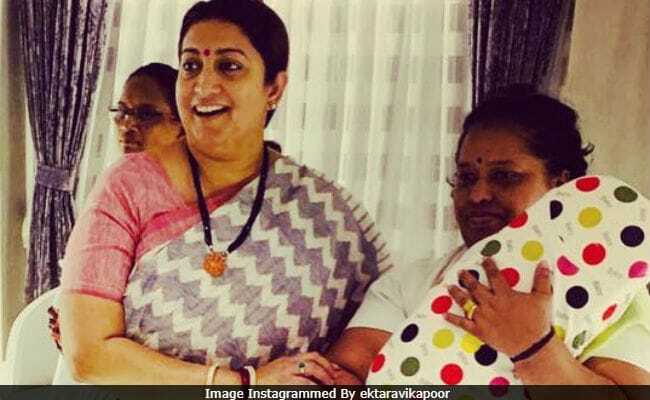 New mom Ekta Kapoor, who hosted a naamkaran ceremony of her son Ravie on Monday, treated us to a picture of union minister Smriti Irani with the baby. "Maasi special," Ekta captioned the photo, also featuring her mother Shobha Kapoor. However, in the picture, we cannot see Ravie's face as he is wrapped in a blanket and is cradled in his nanny's arms. This is the first picture Ekta shared of baby Ravie, who was born via surrogacy on January 27. Ekta's post has been liked by celebs like Mouni Roy, Rhea Kapoor, Anita Hassanandani, Maheep Kapoor and others. Ravie's naamkaran ceremony was hosted at Ekta's Mumbai home and was attended by several film and TV stars. Abhishek Bachchan came with sister Shweta Bachchan Nanda while Karan Johar accompanied mother Hiroo Johar. Mouni Roy, Swara Bhasker, Rhea Kapoor also attended the ceremony while the TV industry was represented by stars like Divyanka Tripathi, Vivek Dahiya, Anita Hassanandani, Karan Patel, Vikas Gupta, Hiten Tejwani and others. Ekta Kapoor announced Ravie's birth four days after he was born. "By God's grace, I have seen many successes in my life, but nothing beats the feeling of this beautiful soul being added in my world. I cannot even begin to express how happy my baby's birth has made me," read an excerpt from her Instagram post. After Ravie's birth, she shared a heartwarming picture of nephew Laksshya (Tusshar Kapoor's son) watching over baby Ravie. Tusshar is also a single parent to Laksshya, who was born in June 2016 through surrogacy. Ekta and Tusshar Kapoor are children of veteran actor Jeetendra and wife Shobha Kapoor.